NASHVILLE, Tenn. – Exciting trio and Homeland Entertainment recording artist Three Bridges took part in a special Nashville Flood Relief benefit concert this past weekend. The group debuted its new line-up at the special event. It was announced earlier this month that celebrated vocalists Shannon Smith and Jeremie Hudson would be joining the popular trio. A large portion of those in attendance came to hear the group, and the audience response was tremendous after the group performed. 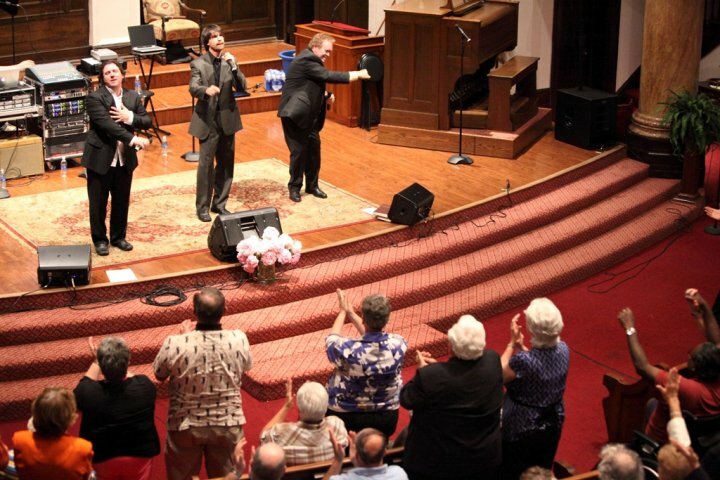 In addition to Three Bridges, several of Southern Gospel’s brightest names appeared at the special Flood Relief benefit concert this past Friday evening, May 14, 2010. The event was designed to help raise funds to aid in relief from the devastating floods that hit Nashville and other Middle Tennessee communities earlier this month. Other artists that participated in the event included Palmetto State Quartet, Sunday Edition, Men of Music, Freedom, Dianne Sherrill, The Sargents, Firm Foundation Quartet, Allen Frizzell, Angelina McKeithen, The Songfellows, Mystery Men Quartet, Jeremy Calloway, and Southern Salvation. Award-winning Country singer Naomi Judd served as the special guest emcee for the program as well. Three Bridges recently scored their latest Top 10 hit according to the April 2010 issue of the Singing News Top 80 chart. “It Took His Breath Away,” from the Homeland Records release Another Blessing peaked #10 last month. The song has also been a regular fixture on the AbsolutelyGospel.com (formerly SoGospelNews.com) Top 40 Weekly Chart, Christian Voice Magazine Top 100, SouthernGospelTimes.com Top 40 Fan Chart, and other charts.